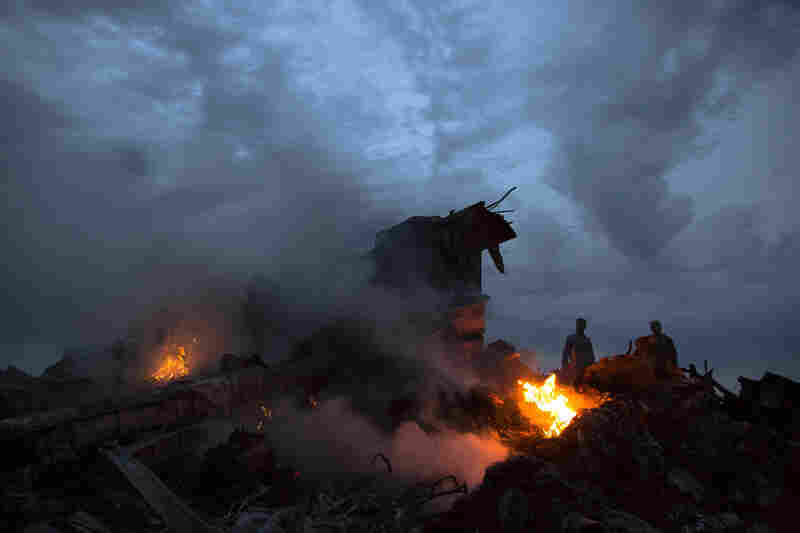 U.S. Officials: Malaysian Airliner Likely Shot Down : The Two-Way Vice President Biden says it appears that the Malaysia Airlines jet with nearly 300 people aboard was "blown out of the sky" over eastern Ukraine. 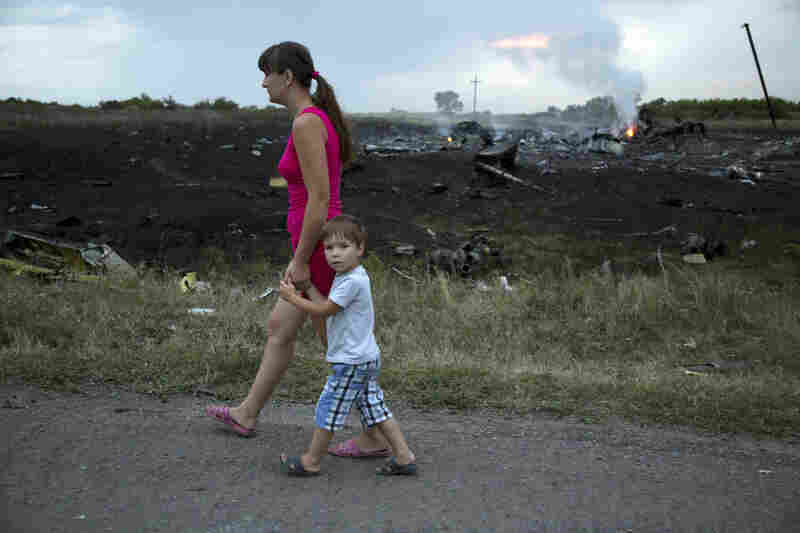 People walk amongst the debris at the crash site of Malaysia Airlines Flight MH17, which went down in eastern Ukraine on Thursday. A firefighter sprays water on the wreckage of Malaysia Airlines Flight MH17, which went down in eastern Ukraine on Thursday. 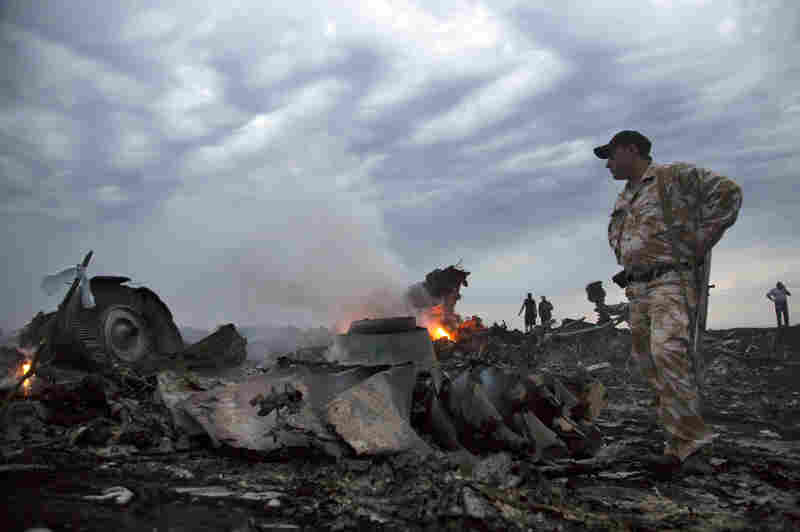 The Boeing 777 had 298 people aboard when it crashed in an area that has been wracked by a separatist insurgency. 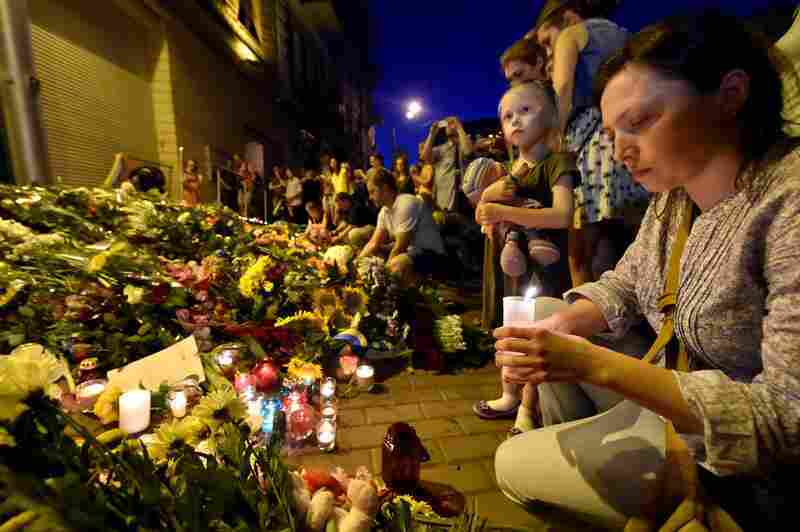 A woman lights a candle in front of the Netherlands Embassy in Kiev, Ukraine, to commemorate those aboard Flight MH17. The flight was on its way from Amsterdam to Kuala Lumpur when it crashed. Malaysia Airlines lost contact with the plane when it was about 31 miles from the Russia-Ukraine border. U.S. officials tell NPR that the airliner was likely shot down by a surface-to-air missile. A woman at Kuala Lumpur International Airport reacts to news of crash. The flight was on its way to the Malaysian capital. Bodies, debris and wreckage from the Boeing 777 were strewn over a field about 25 miles from the Russian border, where fighting has raged for months. The White House said President Obama and Russian President Vladmir Putin discussed the crash in a phone conversation Thursday. 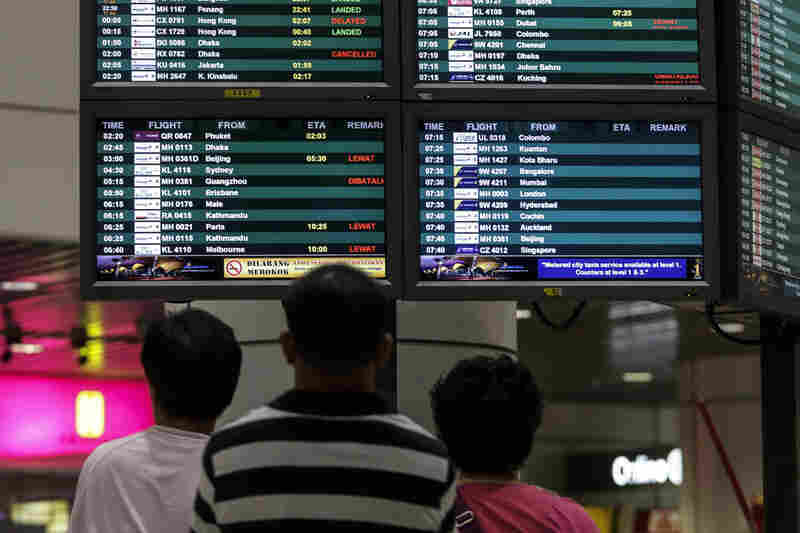 Passengers at Kuala Lumpur International Airport look at a flight information board. "Our thoughts and prayers are with those on board the Malaysia Airlines airplane lost over Ukrainian airspace, as well as their families and loved ones," Boeing said in a statement. "Boeing stands ready to provide whatever assistance is requested by authorities." Ukrainian President Petro Poroshenko said evidence from the crash must remain in place until investigators can look into "all aspects of the tragedy." The airline's senior vice president and European chief, Huib Gorter, told reporters the plane was carrying at least 154 Dutch, 27 Australians, 23 Malaysians, 11 Indonesians, six Britons, four Germans, four Belgians, three Filipinos and one Canadian. The nationalities of 47 passengers had yet to be determined. All 15 members of the crew were Malaysian, Gorter said. Initially, Ukrainian President Petro Poroshenko said he would not exclude the possibility that the plane had been shot down, but later he called the crash of the jetliner an act of terrorism. Vice President Biden said Thursday that it appeared that the downing of the plane was not an accident, but that it had apparently been "blown out of the sky" in what he described as "truly a grave situation." The head of Ukraine's emergency agency was quoted by Reuters as saying "armed terrorists" were hampering efforts to reach the crash site. However, the AP, citing Russian sources, says separatists planned to call a three-day cease-fire to allow crash investigators access to the area. 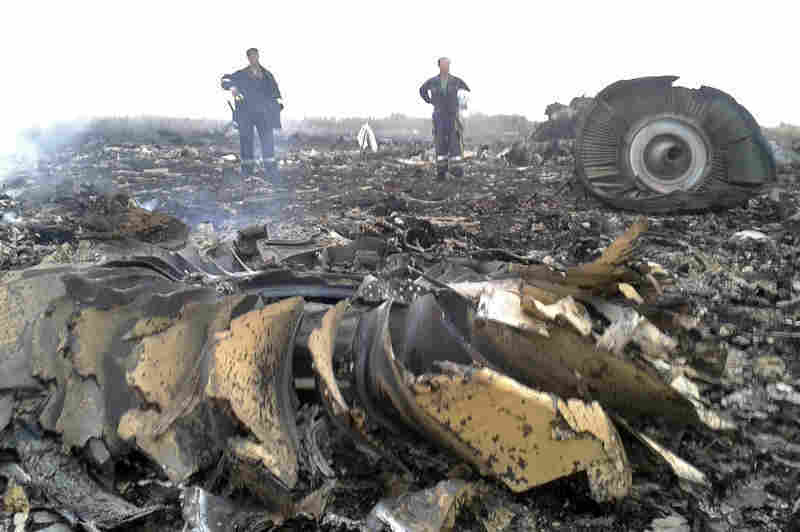 A separatist leader based in Donetsk, Ukraine, where the plane reportedly went down, said his fighters took no action, telling Interfax that they don't have weapons that could reach that altitude. Ukraine reported earlier Thursday that two of its aircraft had been shot down in recent days. 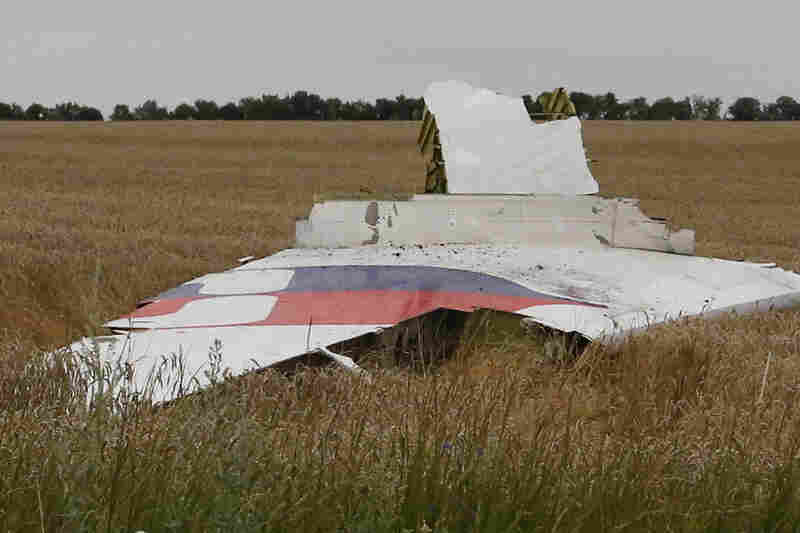 NPR's Corey Flintoff notes that a rebel military commander, Igor Girkin, had tweeted that his forces had shot down a Ukrainian cargo plane at about the same time the Malaysian airliner disappeared. The tweet was subsequently deleted. U.S. officials tell NPR that the airliner was likely shot down by a surface-to-air missile and that they are trying to determine which side fired it. A congressional staffer says that U.S. surveillance assets covering the area should be able to determine a cause of the crash and that lawmakers expect a report within 24 hours. "At this stage, it seems likely that it would have been an accident, because it's hard to conceive why any side in this conflict would want to shoot down a Malaysian airliner," NPR's Geoff Brumfiel tells All Things Considered. "Flight MH17 operated on a Boeing 777 departed Amsterdam at 12.15pm (Amsterdam local time) and was estimated to arrive at Kuala Lumpur International Airport at 6.10 am (Malaysia local time) the next day. "The flight was carrying 280 passengers and 15 crew onboard." Data on the FlightAware website suggest MH17, a daily flight, normally travels at an altitude of around 33,000 feet, or some 6 miles in the air. A video posted to YouTube showed a smoldering area on the ground that is said to be the crash site. Another video showed what are presumably pro-Russian separatists going through passports and other passenger belongings at the purported crash site. "I am shocked by reports that an MH plane crashed. We are launching an immediate investigation," said Malaysian Prime Minister Mohd Najib Tun Razak, in a tweet. Razak said at a news conference later that no distress call was received from the aircraft, which he said had flown an internationally approved flight path. Russian President Vladmir Putin discussed the plane crash with President Obama during a telephone conversation between the two leaders, the White House confirmed. Obama said the "world is watching" reports of the downed jetliner. "It looks like it might be a terrible tragedy," he said, adding that his team is trying to determine whether there were any Americans aboard the plane. "That is our first priority." "The United States will offer any assistance we can to help determine what happened, and why," he said. 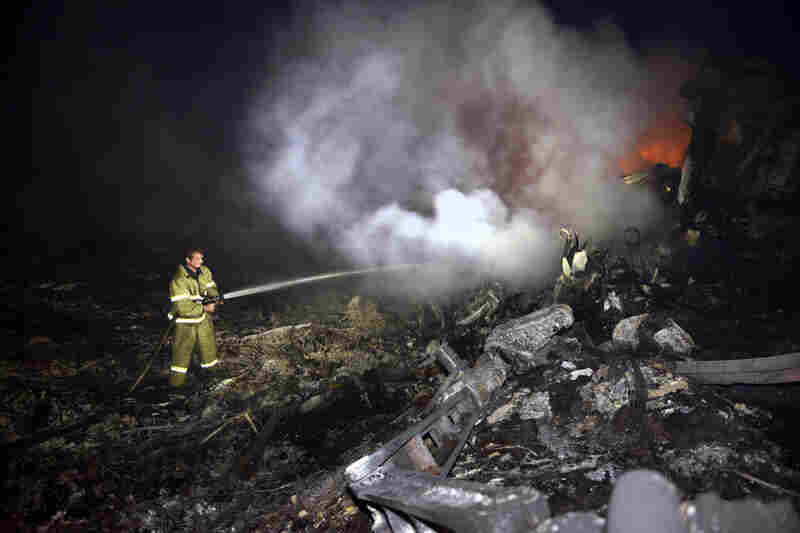 Putin was quoted by Russia's RIA news agency as saying that Kiev bears responsibility for the loss of the airliner and that the disaster would not have happened had Ukraine not resumed an offensive against pro-Russian separatists. In a phone call between Obama and Poroshenko, the White House said the Ukrainian leader emphasized that evidence from the plane crash must remain in place until investigators can look into "all aspects of the tragedy." The U.S. Federal Aviation Administration also warned airlines last month about flying over parts of Ukraine owing to the ongoing conflict, but the warning did not specifically cover Donetsk, where the plane went down, nor did the International Civil Aviation Organization, or ICAO, warn of that region. In a statement Thursday evening, the FAA expanded that warning saying it was prohibiting U.S. flight operations in the airspace over eastern Ukraine. Several airlines announced after Thursday's crash that they were rerouting jetliners that crossed airspace over the conflict zone in eastern Ukraine onto safer flight paths. Boeing issued a statement saying, "Our thoughts and prayers are with those on board the Malaysia Airlines airplane lost over Ukrainian airspace, as well as their families and loved ones. Boeing stands ready to provide whatever assistance is requested by authorities." The Netherlands' Prime Minister Mark Rutte called the loss of the plane, which carried dozens of Dutch nationals, "possibly the worst air accident in Dutch history." The country's foreign minister called for "unhindered access" to the crash site.